Buy Fonio for a diabetic diet or use it to cheat your keto diet? Well, here... – Juka's Organic Co. Need a diabetic diet or want to cheat your keto diet? Well, here is something you will thank us for later, Ancient African Wholegrain call FONIO. BTW, you don’t have to be diabetic to eat this superfood. It is meant for everyone that wants to have a wholistic healthy diet or lifestyle. Fonio has a very low glycemic index level, unlike other grains that are harder to digest such as rice and regular grits and any other carbs you can think of. Because of this it is the go to carbs that you body can easily digest. You can make FONIO in many ways; BREAKFAST, SUBSTITUTE FOR RICE, ADDED TO SOUPS. Enjoy a bowl of fonio as a breakfast food and you will go for hours and not get hungry. It is filling but yet very healthy. This wholegrain is accredited with many nutritional values. Unrefined Fonio Has Potent Folic Acid, Fiber, Iron, Protein, Calcium, Magnesium & Many More Nutrients. It Is A Great Vegan Protein & It Is Also Gluten Free. Add 1 cup of FONIO in a pot, 3-4 cups of water, add pinch of salt (to taste). Bring to boil until there is a thick consistency. Add coconut oil and any condiments of choice. 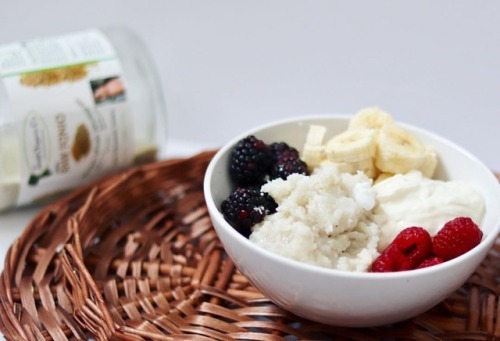 Serve in a bowl with your favorite fruits and some Greek honey yogurt for a smoother delicious breakfast.